Installation errors cause comfort and energy problems. Fiberglass batts must be installed perfectly to provide maximum R-value. 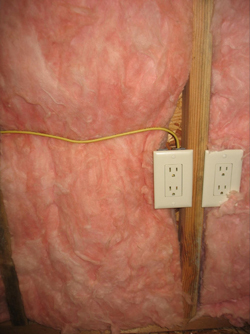 The void or empty space around the electrical outlet box is a common mistake made during installation. Fiberglass batt insulation has been the main "go-to" insulation for houses since the Owens Corning Corporation invented the material in 1938. Today fiberglass batt insulation is still used extensively, even though more modern insulation materials like spray foam and rigid foam have superior performance characteristics. Batts can be unfaced or faced with a variety of materials, including kraft paper, foil-faced kraft paper and plastic. The faced side of the batt should always be oriented toward the conditioned space, rather that toward the exterior of the building. Builders and homeowners like fiberglass batt insulation because it’s more affordable than other types of insulation, and because it can be installed with a bare minimum of basic tools. The main disadvantage with batts is that careful installation is required to eliminate energy-wasting airspaces or voids. It’s very difficult to complete a fiberglass insulating job without leaving a few gaps in coverage, and even a small void can diminish overall R-value by 50%. Fiberglass loses R-value when it’s compressed, overly "fluffed" or wet. Permeability is another disadvantage. Fiberglass can’t stop air leaks, even when it’s perfectly installed. To attain its maximum R-value, fiberglass batt insulation must be in a “still” space, undisturbed by air leakage. If your house has fiberglass batt insulation in walls, floors and attic areas, it’s probably not doing an adequate job of insulating your home’s building envelope. As a result, you’re paying quite a bit more than you need to for heating and cooling, while interior comfort is also compromised. The good news is that existing fiberglass batt insulation can usually be left in place, while additional insulation is installed over or around it to improve comfort and reduce utility expenses. Specially formulated Injection Foam insulation can be placed in wall cavities, flowing around existing batts and offering the dual benefits of air sealing and improved R-value. In the attic, loose-fill fiberglass or cellulose insulation can be blown over existing fiberglass batts after air-sealing the attic. Many attics have just R-19 or less of batt insulation, while the Dept. of Energy recommends at least R-49 attic insulation levels. So the addition of blown insulation is a smart upgrade that will payoff quickly in energy savings.